But no, surprise surprise, what we have here is exactly what the name suggests. I have not yet worn it next to Diorissimo, and I don't know that I ever will, so this will not be a blow by blow comparison, and to attempt one would be pointless in any case — I have no idea what a new bottle of Diorissimo smells like these days, and I plan to remain blissfully ignorant on that score. What I can tell you is that the opening of Muguet Porcelaine induces the same euphoric feeling I get from the first spray of my nicely-aged vintage versions of Diorissimo: ah, spring! For a few seconds, I thought Ellena might be wading deep into Roudnitska territory, but no, it is recognizably a Hermès pretty quickly. There is a blurred green backdrop, heavily (in the relative sense) spicy-herbal-peppery for a very brief time, then mildly so, smoothed over with the watery effect we have seen in a number of Ellena's recent fragrances. And there is lily of the valley. It is not air-freshener clean, but it is not at all indolic either, and while it is lily of the valley straight through to the end, after the top notes fade it stays comfortably nestled in its greenery; it is not a bouquet pressed to the nose (although you can extend the lovely opening by spraying it on clothing or a scarf). The overall effect seems to encompass the whole of the dew-soaked garden, as such, it feels more relaxed / casual, cleaner, and less overtly feminine than Diorissimo. As you'd expect, it is a sheer fragrance, with a pale base, and it works best when applied generously, even then, you're going to need to reapply in a few hours. Verdict: I think it's perfect, and I know I've typed this sentence a dozen times over but I'll type it again: you know who you are, and you either like Ellena's style or you don't. I do. When I reviewed Cuir d'Ange I noted that I divide the Hermessences into three categories: the few I don't care about at all, the few that I need in 100 ml, and the rest, which I generally need in 15 ml. Muguet Porcelaine joins the latter category, and just as well since I've already got the little green-tinged bottle in my possession (bought unsniffed, may Donatella have mercy, and while I'm at it I'll confess to my brand new coffret with L'Ambre des Merveilles, Terre d'Hermès, Le Jardin de Monsiur Li and Eau de Néroli Doré). 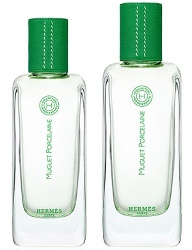 Hermès Muguet Porcelaine has not yet launched in the US (at least, not online). In the UK it is available in 100 (£171) and 200 (£260) ml Eau de Toilette. 15 ml bottles will also be available in the gift sets (4 x 15 ml, $156). Note: top image is lily of the valley [cropped] by Aleksey Gnilenkov at flickr; some rights reserved. 1. And as reader Coumarin pointed out when I announced Muguet Porcelaine, Ellena apparently ignored the many suggestions for the next Hermessence that we gave him in a poll question at the end of my review of Cuir d'Ange. 2. Ellena on Diorissimo: "It's one of my points of reference. No, it's more than that; it's among the creations I admire because it so accurately captures the difference between a smell and a perfume. Its starting point is the smell of lily of the valley. The end point for a composer of perfumes is to transform a unique smell into a perfume. [...] So we have our theme, our idea; now we have to add something of ourselves: our own desires and — this is the most complex part — our personality." The Diary of a Nose: A Year in the Life of a Parfumeur, p. 109. 3. Ellena on gardenia: "The gardenia perfume I like best is Chanel's, because it does not smell of the flower but of happiness." Ibid., from "A Summary of Smells" at the end of the book (no page numbers). 4. I should mention that the Van Cleef & Arpels definitely came out after IFRA restrictions made it harder to make a decent lily of the valley fragrance, so I presume it still smells pretty much like it did when I reviewed it. I'm not so sure about the others mentioned in that paragraph. Thanks for the review! I’m excited to try. Curious–which are the ones you need in 100ml and 15 ml? 100 ml — if in terms of how many mls I’ve gone through since they launched, Osmanthe Yunnan is number 1, followed by Vetiver Tonka and then Rose Ikebana. 15 ml is everything but the ones I don’t like – Iris Ukiyoe, Santal Massoia, Paprika Brasil. I have never really made up my mind about Epice Marine. Lovely review! And doesn’t Donatella forgive all? Oh good for you Robin! I know how you rarely buy a new fragrance quickly as it’s released, so when you do I take notice. I must admit I am not a big fan of lily of the valley scents (although I *despise* lily scents…whereas lily of the valley are just not my thing) but of course I will smell it next time I’m at the absolutely gorgeous new Miami Hermes boutique in the Design District. Never hurts to go into Hermes, but if you do not like lily of the valley will be VERY surprised if you like it! I was surprised to find that I liked Rose Ikebana and chose it when we split a nomad set. I also liked Neroli Dore. I got a nomad of Epice Marine when it first came out because I was intrigued with the idea of the collaboration between JCE and a famous chef, but I can’t get used to the combination of cumin and marine notes. I’ll sniff it once a year or so to see if I ever get my nose around that. Hermes does give generous samples, but they’re not sprays, and given how light many of their scents are, yes, spraying is better! Yeah, I’m still on the fence about Epice Marine myself. I believe that Hermès may have switched to spray samples recently. To my surprise, the 4 ml sample of Vetiver Tonka that I picked up at the swap meet came in a spray vial rather than the usual test tube. Yes, the samples we got at the Hermes boutique recently were sprays. Not quite as diffusive as the ones on the regular bottles, but good. The nomad sprayers are a bit puny, actually. I’m a bit sorry I didn’t get a FB of Iris Ukiyoe back when I was spending more freely. I bought a four-pack last year on vacation having only barely tried three of the four scents and the fourth not at all: you’d think I would know better by now. Cuir d’Ange and Brin de Reglisse are pure heaven and Vanille Galante is wearable enough, though not quite my thing, but Épice Marine, which I bought blind, is just not for me at all. I keep trying and it keeps saying no. I’ll just have to swap it away to someone who will love it and give it a good home. And I love Brin too but that seems to be an acquired taste as well. Helloo! If you want to relocate your Épice Marine, I could help you out. I’ve got all sorts of things I’d trade. I’ve got a Santal Massoia I wouldn’t mind swapping if anyone sees this and is interested. I love Vanille Galante, but shockingly my husband said it smelled like a sewer on me. !!! It smells like bandaids on a banana when I wear it. I’m charmed by the name but I’m not sure if I will like this one. Surprisingly I was hooked by Le Jardin de Monsieur Li and bought 50 ml bottle and I also look forward to trying L’Eau de Neroli Dore. I really like Jardin de M Li, and if I already didn’t have tons of Goutals, I’d buy it. It reminds me very much of something that would normally be released by the house of Goutal. Very nice indeed. I had been considering getting in on a split of this, but was held back by the fact that it is Ellena for Hermes, and will disappear within minutes on me. Glad I did. I still have a tester bottle of 2006 Diorissimo (that I have not worn in aaaaaages, since I have found – I blush – that I prefer Tauer’s Carillon pour un Ange). Love the quote about Chanel Gardenia smelling of happiness. Perhaps I should try that one. Chanel Gardenia smells like 5 min of lovely bright white “chanel” flowers with LOTV and then the rest a classic Chanel drydown like what used to be Allure extrait or Beige. I hope I am not speaking out of turn here, but I think if you found a bottle in your lap you’d be reasonably pleased with it on those days that you want something OK to wear, otherwise, you are better off spending your nose time and money in more promising lilies…. I would agree with that, although I haven’t smelled a new bottle of that in ages either. I thought of it as a pretty jasmine. Well, maybe I’ll just be satisfied with my 5ml of 1932, then. I don’t even know what 2006 Diorissimo is like — I have been studiously avoiding new versions for a very long time. Nice to sample, but it’s surprisingly blah. I have a sample and have not drained it- that’s how blah it is, and I tend to like ALL of the CHanel Exclusifs releases. Your money is better spent elsewhere. I also like Carillon pour un Ange, although it’s so strange it took me a while to appreciate it. Now I love it. You haven’t tried Gardenia, Mals?? I’m pretty sure you sent me a sample of it way way back with a freebiemeet scent! I have a bottle, I can make you a sample if you’d like? Lovely review. I suspect I will like it very much. I’m a massive fan of JCE. I got lucky and sniffed this on his wife before it came out (she attended a conference he gave that I went to) tragically it had worn off so I can’t wait to smell it properly. Great timing of course for this release. Exactly! It was still in the testing stage though. She was very gracious. Yay! I was hoping it would be good. Will definitely be on the lookout for this once it is released here. JCE’s style can be a bit hit-or-miss for me, but this sounds like something worth giving a try. After getting a spray sample of Cuir d’Ange with my 15ml of Vetiver Tonka from the splitmeet, I started thinking maybe I’d like to eventually get a coffret for myself so that I could have 15ml bottles of Cuir d’Ange and Osmanthe Yunnan, and I don’t know what the other two would be since there are a few Hermessences I haven’t tried. But I feel reasonably confident that I could find two more that I would want in 15ml. I need a small bottle of Cuir d’Ange too, but I figure Hermes has enough of my money to tide them over for a bit (ha!) so will wait, maybe til the next Hermessence. I’m going to get another set… they’re perfect for me. Not sure what I will choose this time, like you Cuir d’Ange will be in there, maybe this new one….VT again and ?! Did you know JCE took ten years to perfect Cuir d’Ange? I got my mom a bottle of Debut two year’s ago Mother’s Day. It still smelled like my old bottle. It is hands down my favorite (I haven’t smelled the Hermes, yet) LoV currently on the shelf. I am really looking forward to this one. Much like my TWG cart, my Hermes coffret has yet to hit that perfect hit the buy button selection. Maybe desire to smell this without driving to Bal Harbour will push me to finally choose a set. Very good to know, I do love Debut. I would buy way more DelRae if they would do 15 ml! (and that goes for lots of brands — I do love JCE but the 15 ml has a lot to do with my Hermes spending). Good to hear that it really is a muguet, as I hoped! Can’t wait to try it. I cracked myself up, sort of, by being surprised that it was muguet. But hey, Vanille Galante! I so excited to try this, naturally. There is no finer music to my ears than “New JCE.” I can’t think of any perfumer who comes close for me. The way you describes this makes me think of Jour, perhaps, if a little more shy. Ugh, I might follow suit and get a travel spray…. Part of my thinking was that the travel sprays are so easily swapped. Great review! I’m excited about this because I’m a huge Hermes and JCE fan. Plus lily of the valley holds sentimental associations for me. Coty’s Muguet de Bois was my first fragrance as a girl, a gift from my father. Oh how lovely! Then you must try it. I’ve been both looking forward to and dreading this review…I am in the “yes to JCE” camp and now am almost certain I’ll want this one! Thank heavens that Hermes is one of the few out there that are happy to provide samples. Yes — gracious with samples, free shipping, small sizes. Yet they’re making money! So I don’t understand why the other luxury labels aren’t following suit. This sounds absolutely lovely and I love the bottle, too. I’m not always a fan of lily of the valley, but I am a fan of Diorissimo and will give it a try this weekend. And I cannot praise the coffrets enough – they are the main reason I own 8 Hermes scents (and will soon own 12). I am so excited to try this, one of the few new releases that really interests me. I love lily of the valley scents , i hope the Hermes boutique in Montreal receives this soon. I often wait for your review to vet a perfume I want to try but this time I did not wait. I’ve enjoyed most all the Hermessences and love a few. Great review…looking forward to trying it tomorrow. I’m obviously more of a lurker here, but I feel compelled to tell you that I’ve been waiting and counting the minutes for this review. Thank you! It certainly didn’t disappoint. LotV brings me to my happy place. I went through a phase where I had to buy every inexpensive fragrance I could get my hands on: Body Time Muguet, Coty Muguet des Bois, Yardley LotV, Woods of Windsor LotV, Molinard Muguet, Jessica McClintock, you name it. My very favorite is Yves Rocher Muguet en Fleurs. But I haven’t felt justified in splurging on a LotV fragrance until now I must have this one! Thanks again for the review. Oh, do tell us what your favorite cheap LOTV was, other than the Yves Rocher! I am curious about the Body Time as I do like that brand, and esp. the custom-scented lotions. Sheer and ephemeral sounds amazing. I have a gorgeous multiple colored ombre cashmere scarf that I think of as ephemeral and I’ve always wanted to find the perfect scent to match it’s beauty. I hope that I can get to a Hermes sometime soon so I can smell more of their scents. Unfortunately it sounds like a lot of the local perfumistas just went, so we probably won’t be hitting the Hermes Boutique on Saturday! And so far as I know, it is not in the US yet. Sounds nice and I am a fan of Hermes and the Hermessence line. Vetiver Tonka and Cuir d’Ange are my absolute favorites from the line and really like others too. Hope I’ll be able to try this one. Sounds worth a shot then! 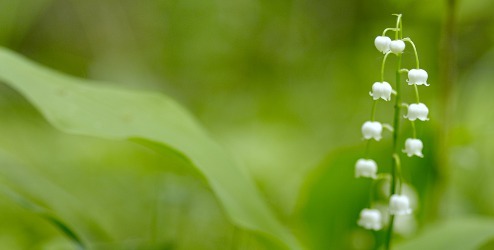 Good Lily of the valley is the comme des garcons version, ‘Lily’. under the green series. Another is Tauer’s Carillion pour une Ange, which has a wonderful green quality reminiscent of undecavertol.